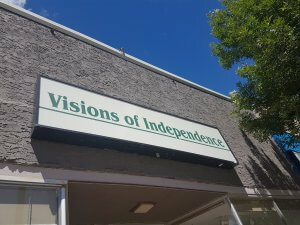 Vision of Independence Inc. (VOI) is a not-for profit charitable organization, that provides housing and programs to persons with intellectual disabilities. VOI provides residential, day, and supported independent living programs in Winnipeg and Portage La Prairie. VOI has received a loan guarantee to assist with the purchase of a training centre building and general office located in Portage La Prairie, Manitoba. Since opening in 2001 services have expanded and adjusted based on the needs of the community. Many individuals have used the service from the Pelican Lake facility and continue to connect to VOI through families, high schools and friends.